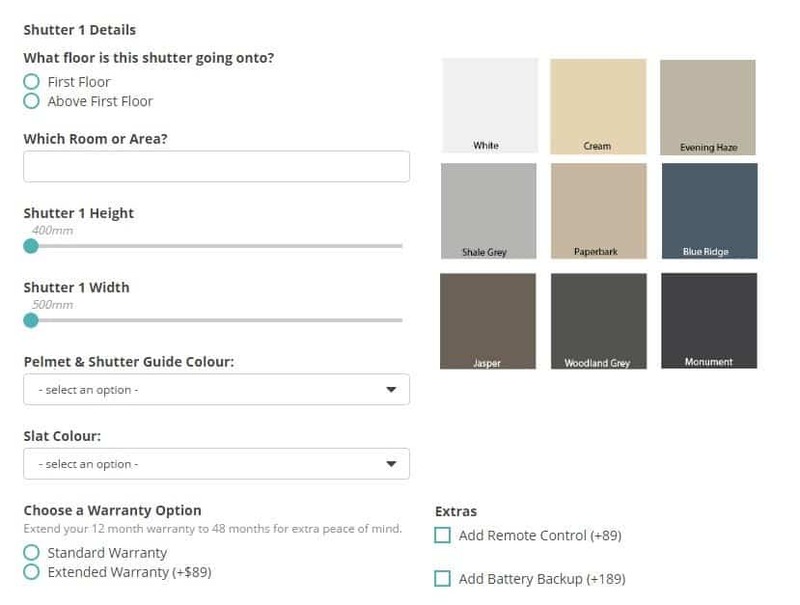 Ultimate Shutter's Shutter Ordering System - Over the past 29 years we have refined our ordering process to ensure our customers get exactly what they need to complete a perfect installation every time. 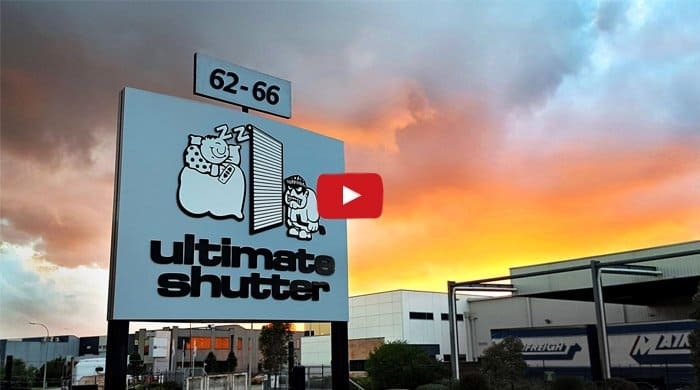 Some shutter companies ask the fewest questions needed to get your money. Size of the shutter & colour. That's it. Second floor installations require scaffolding, though. They won't tell you that until after you've seen the initial price. On a DIY or Installed order, like we do through Roller Shutters website, we have to ask a lot more than size and colour. Do you need a sill stop? Do you have room above the shutter to do the installation you are considering? What about door handles & packing material? Without knowing these details you are ordering a simple roller shutter, not the right roller shutter. OrderRight™ is designed to eliminate this type of back-and-forth with your shutter order. Whether you're ordering installed shutters or DIY through this website you can be sure that our process will ensure you get the right shutter with all the right options. You only know your order is correct when you OrderRight™. These two questions are important to your order & installation. If a company doesn't know which type of wall you have they have a choice to make: include the wrong fasteners or include all possible fasteners. What are the problems with including the wrong ones? Obviously, if you have a brick home and get screws for rendered foam, it simply won't work. You'll be on your way to a local Bunnings to pick up the right ones and wondering why the shutter came with the wrong type. Similarly, if we don't ask you about window types you may not think about opening the windows with the shutter down. We need our customers to know upfront that if you have windows that open into the area of the shutter you may have a problem, especially on in-reveal installations where the shutter guides would block your windows from opening. 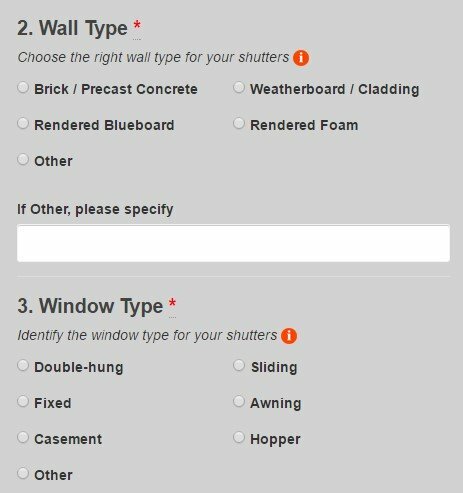 We check each order and ask the right questions to make your installation simple but also ensure you can use the shutter how you wish. The sample form to the left shows the OrderRight™ system in action. This is a sample form for ordering a single shutter. We allow you to get a quote & place your order knowing the full price is what you see. We are not only taking height & colours into consideration but the possibility of scaffolding, extras & extending your warranty for better protection on your investment. On this form, unlike our DIY projects, we don't need to know about sill stops & opening clearance because our expert installers will be on-site doing the work for you. So we don't ask those questions here. Everything is designed 100% for the customer to answer only what is necessary but everything that is necessary to complete a perfect transaction every time. We hope you've enjoyed this run through the Ultimate Shutter OrderRight™ system. We are continually improving our processes and if you see a way to make it even better or faster, let us know!